‘A healthy mind in a healthy body’was the cry in Victorian and Edwardian England. 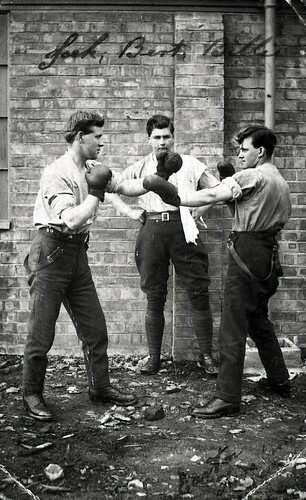 As the Great War progressed professional soldiers were inevitably replaced by conscripts. The average height of a soldier was about 5 feet, 5 inches. Their packs weighed over 75 lbs and that was without their Lee Enfield rifle. Their clothing was wool, their boots were heavy. They regularly had to walk about 30 miles a day. High calorie food was provided in the form of hard bread rations and sugary tinned jam. The bread ration was a kind of biscuit that could be broken up and crumbled into soup, tea or hot water. Remarkably some of these survive. Not even the rats or mice saw them as appetising. Robert Graves writes about using them as fuel in ‘Goodbye to All That’, his autobiographical account of his wartime experiences. Some men ate better during the war than they had in peace time. 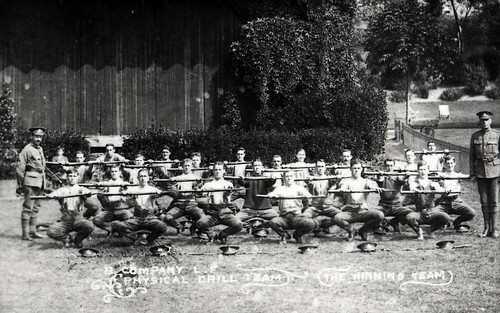 It’s said that some of those who survived uninjured were in better shape by demobilisation than they had been at enlistment. 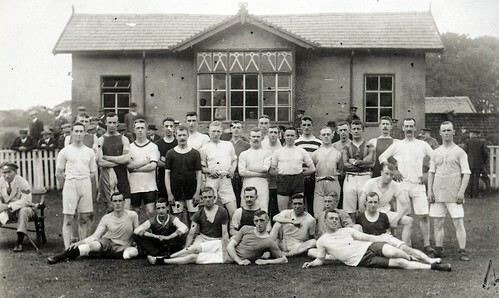 Sports activities were part of the process of building stamina and team spirit, and keeping up morale. The story of the Christmas football game between opposing forces continues to capture the imagination. Whether or not it really took place, there’s still a desire to believe the story. 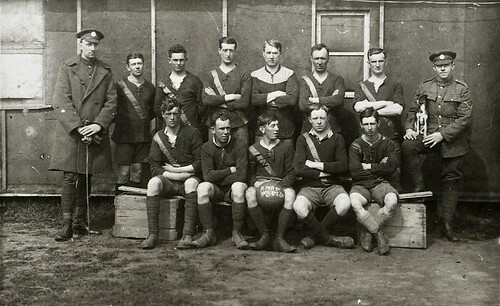 In the Documentary Photographic Archive there are photos illustrating the role of sporting activities in the army. 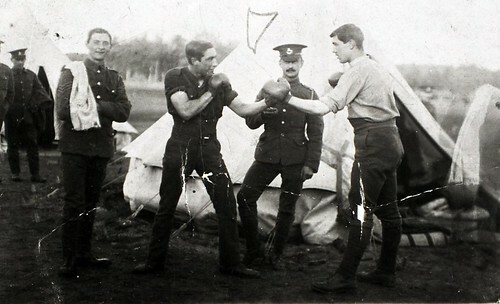 These boxers are members of the Royal Flying Corps. This final image comes from a series of photographs depicting life at Calderstones Hospital, Whalley, Lancashire. This was also known as Queen Mary’s Military Hospital. Originally planned as an asylum hospital, this newly built facility was completed as the largest military hospital of its type in the country. 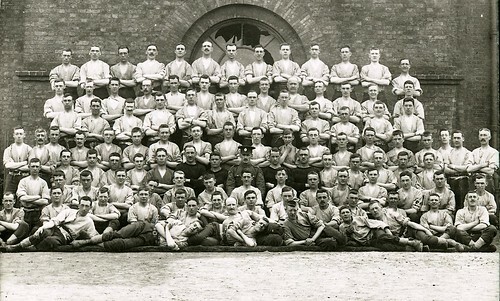 Sixty six thousand British and Allied troops were treated there during the war, and over four thousand beds were occupied after the Battle of the Somme in 1916. 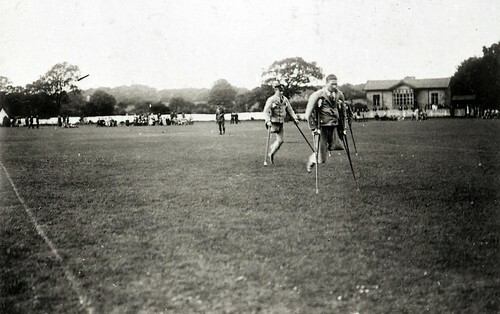 This poignant photo of a sports day there is a reminder that developments in rehabilitation were accelerated by the need for treatment of wounded soldiers. It’s also a reminder that many of the survivors did not come home unscathed.